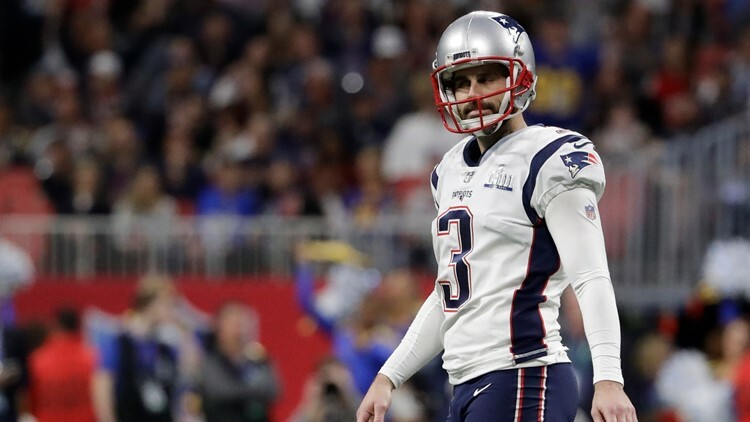 New England Patriots' Stephen Gostkowski reacts after missing a field goal during the first half of the NFL Super Bowl LIII against the Los Angeles Rams on Sunday, Feb. 3, 2019, in Atlanta. Stephen Gostkowski is the Patriots' second-longest tenured player behind only Tom Brady. FOXBOROUGH, Mass. — The Patriots have re-signed kicker Stephen Gostkowski and added tight end Austin Seferian-Jenkins. With the Gostkowski signing, New England is bringing back its second-longest tenured player behind only quarterback Tom Brady. This upcoming season will be the 35-year-old's 14th in the NFL. In the 25-year-old Seferian-Jenkins, the Patriots add a young player that could help fill the void created by tight end Rob Gronkowski's retirement last month. Gostkowski is a two-time All-Pro and member of three Super Bowl-winning teams in New England. He's also the franchise's all-time scoring leader (1,743 points) and is second behind only Adam Vinatieri in career postseason points (198). This past season Gostkowski also became the 19th kicker in NFL history to reach 350 field goals. Seferian-Jenkins has played five NFL seasons with the Buccaneers, Jets and Jaguars. He has played in 43 regular-season games with 29 starts and totaled 116 receptions for 1,160 yards and 11 touchdowns. His most productive season came in 2017 with the Jets when he had 50 receptions for 357 yards and three touchdowns.